The left side took me about a half hour and was basically the same as the right side. I soldered all joints, covered them with tape and bound them together with small zip ties for extra security. 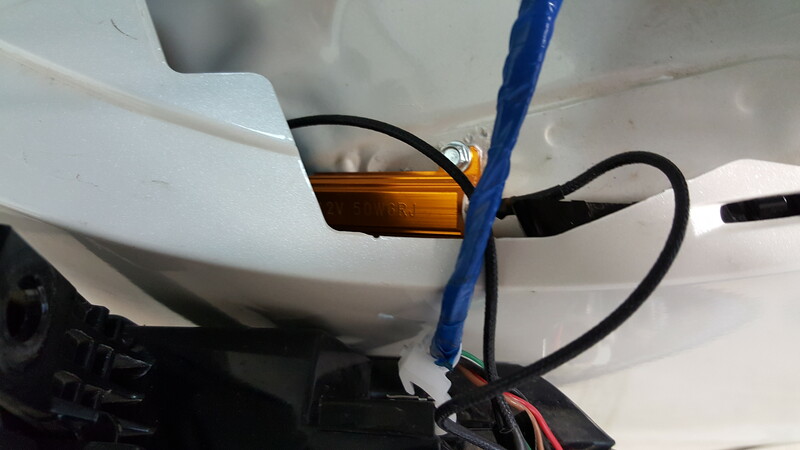 The resistors (50W 6ohm) are screwed to the metal body of the vehicle so as to help dissipate heat and they don't touch any wiring or plastic. I used the same Amber LEDs for all four corners. Link is enclosed. Obviously, you can use any vendor you choose. Just make sure you use quality LEDs and always bench test them before installation. Once you have the taillights removed, you will see that all the pictures make sense. Very simple mod. If you don't know how to wire a resistor, just do a google search. The LEDs are about the same brightness as the OEM incandescent bulbs but the "instant on" of the LEDs make them much more noticeable and attention getting. Now I have all the interior and exterior lighting of my CX-5 converted to LEDs. A couple of years ago, I did the same to my 16 MX-5 GT. One more thing. Based on the specific LED product that I used on all four corners, I did not have hyper flash with just the rear LEDs installed. I knew that would change as soon as I installed the front LEDs. However, for those of you who don't want to work with resistors right away, you can have a "Half Conversion" if you so choose. Again, that is with the specific LEDs that I used. It is possible that other brands may act differently. I have seen this occur with some of the ND, MX-5s on that forum. All LED products are not equal. The following pictures are in no particular order. They are just for reference and familiarization of this project. Last edited by David Paul; 09-16-2018 at 01:35 AM. May I present some comments here. 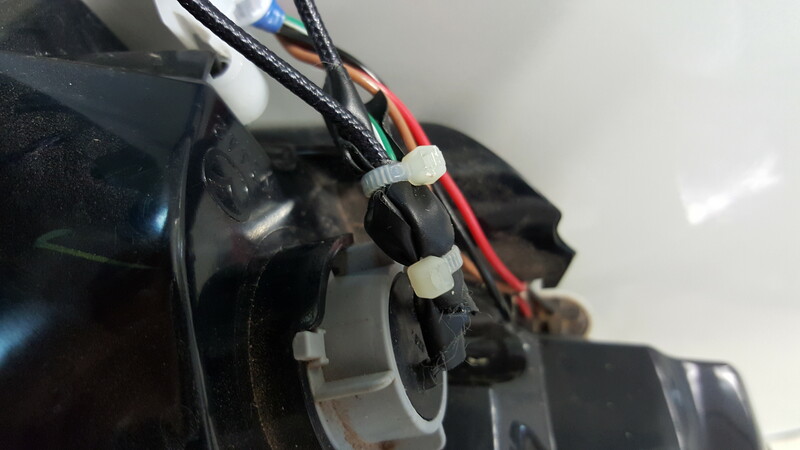 IMO using electrical tape to protect soldering joint is not safe although you did use zip tie for extra security. Electrical tape will be loosing its bounding capability over time especially in the hot or cold environment. It's not safe to use it for permanent purpose. Usually we use "electrical heat shrink tube" instead of tape for best long-term protection to the soldering joint. 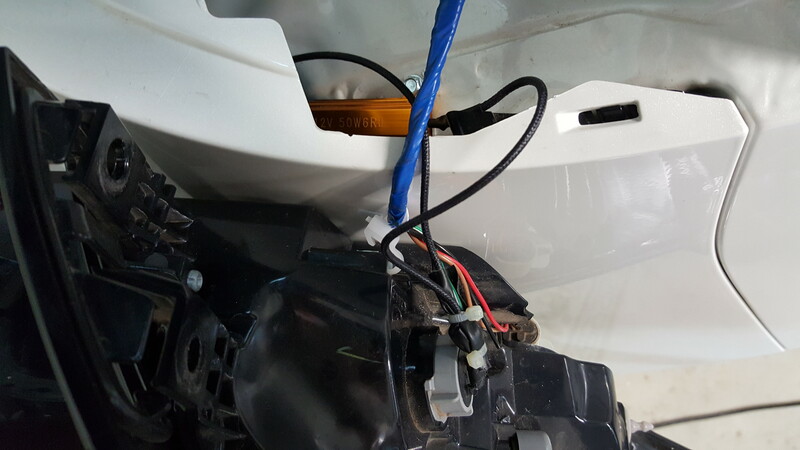 Secondly, for US CX-5 the front turn signals use 7444NA dial-filament amber incandescent bulbs (to serve both turn-signal and parking light) but the rear turn signals use 7440NA (although our owner's manual falsely specified 7443NA dual-filament bulb) single-filament amber incandescent bulbs. We should select those 7440/7444 LED series carefully making sure they support both dual and signal filament bulb functions. More offen people use amber/white "switch-back" LED at front, to get much better effect to distinguish the appearance between the turn signal and parking light during the night. Unfortunately 7440 series LEDs with build-in resister for plug-and-play do not support amber/white switch-back function at this time. I hope Mazda can spend some money using LED turn signals on CX-5 from factory like new 2018 Mazda6. I hate to use big resisters which would generate lots of heat and waste plenty of energy. My use of electrical tape in this situation is only temporary. Generally in this tight of an area, I use several coats of liquid tape but when I opened the jar, I found it mostly evaporated. Sooooo, the next best thing was what I did. I have quite a bit of various sizes of shrink tubing but due to the very short wires involved, I prefer to use the liquid tape as soon as I get some. Due to the short pieces of wire, the shrink tubing will also be very short and will not shrink enough on the ends to be water tight. For now, with the zip ties holding everything together, the tape is very secure and not likely to come off anytime soon unless I remove it. 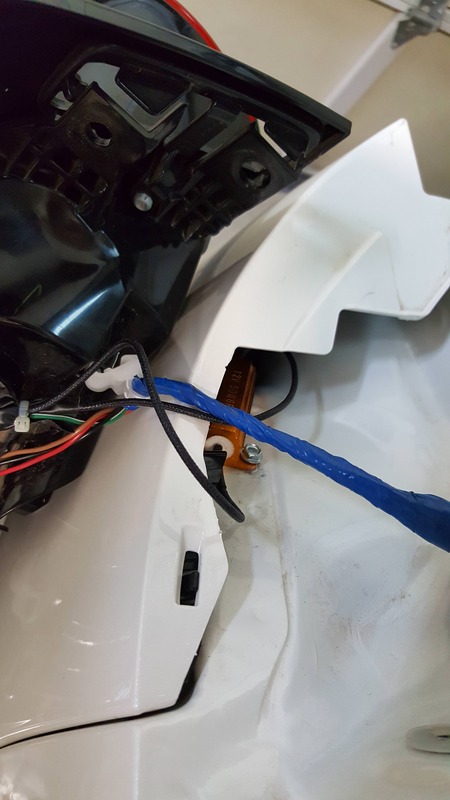 The main thing was to just keep the hot and ground wires from touching each other and anything else that could cause a short. I agree with you regarding the heat generated by the resistors. I don't like it either but as long as they are bolted or screwed down tightly to the metal body, the heat dissipates rather quickly. But in the mean time, a persons gotta do what a persons gotta do. Yes, I am aware of the fact that the front bulbs have dual elements as did my 16 MX-5. I intentionally went with the single color LED because as far as I know, I do not have the option on either of my Mazdas for parking lights. If I do, I certainly have never been able to turn them on. What am I missing here? Of course, it is a very simple matter of getting front replacement LEDs that are 2 colors if I find it necessary or useful. Mazda engineers finally made it very easy to change the front bulbs and to a slightly lesser degree, the rear tails as well. Yes, liquid tape is a better option than heat shrink tube for soldering joint as it’s waterproof. And yes, your GT disabled the front parking lights on both 7444NA amber bulbs which are designed only for US CX-5. So for gen-2 CX-5 GT, getting an amber/white "switch-back" LED for turn signal is irrelevant. LED Signature accent strips added on GT partially block turn signal and LED DRL location on Touring/Sport. And you can see how small and dim the turn signal is on GT comparing to Touring/Sport when the headlights are on! The LED DRL space on Touring/Sport between headlight and amber parking/turn signal looks like unused on GT. Here are some pictures from 2017 CX-5 Touring showing whenever DRL function is on, both LED DRLs and LED low-beam headlights are simultaneously on! You can imagine how GT DRLs work by replacing Touring LED DRLs with GT's LED Signature DRLs. Finally for 2017 CX-5 Touring the high-beam is from the same LED cell for the low beam in the projector, and use a shutter to control them like 2015 bi-xenon HID. 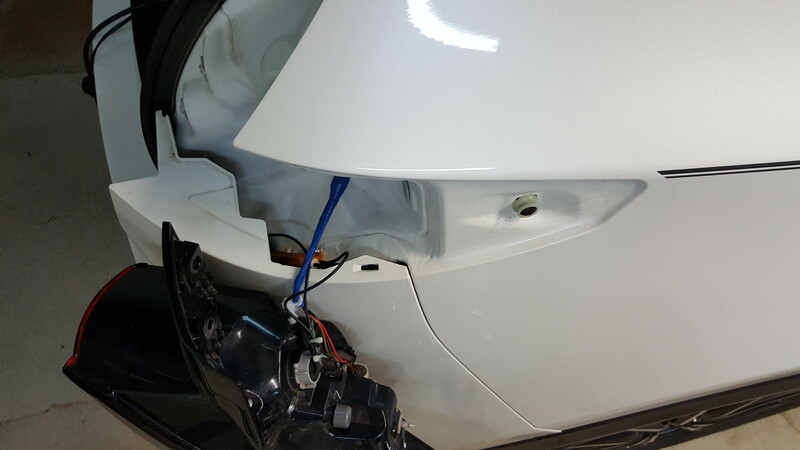 For 2016 LED headlights we have a separate LED cell at inner side of the low beam LED dedicated for high beam only.